The application of enzymatic peeling technology aided with vacuum infusion has been studied extensively in this study to ease the peeling process of key lime (Citrus aurantifolia) fruit. Through response surface methodology, the optimum parameters such as vacuum pressure (450–600 mmHg), pectinase concentration (0.5–1.0%, v/v), duration of soaking time (15–45 min) and their effects on physicochemical properties of key lime fruit have been determined. The optimal conditions determined in this study were 600 mmHg of vacuum pressure, 0.93% v/v of pectinase concentration and 45 min of soaking time. The physicochemical properties analysed such as colour, pH, titratable acidity, total soluble solids, moisture content, and ascorbic acid content show no significant (p > 0.05) effect of enzymatic-peeling on quality parameters of key lime fruit products. The intensity of puree colour was significantly (p ≤ 0.05) improved by the vacuum-aided enzymatic treatment. Overall, vacuum-aided enzymatic treatment is an improved peeling method compared to the conventional method as it simplifies the process, reduces processing time and retains quality parameters of the key lime fruit products. 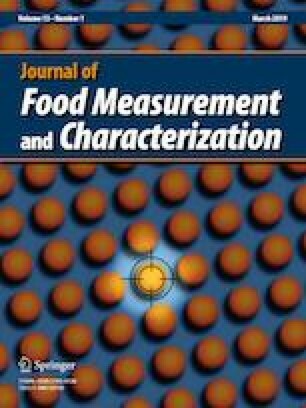 The authors acknowledge the financial support provided by the Universiti Putra Malaysia and mentoring from teaching staff and laboratory staff of the Faculty of Food Science and Technology. Authors extend thanks to colleagues for editing the manuscript before submission.